As the crisp Autumn weather fast approaches it’s time to move towards warm, comforting meals. I think we can all agree that there is little better than walking in the door chilled to the bone and digging into a piping hot dish! 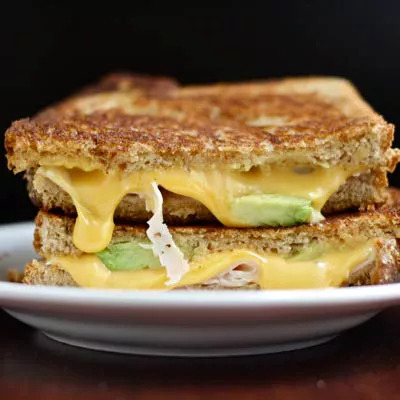 That is exactly why I took to the kitchen this week to makeover this classic Golden Gate Grilled Cheese—creating a healthy, satisfying meal that will be sure to warm you from the inside out. Just follow the simple substitutions below and you’ll have an easy, good-for-you meal that your whole family will enjoy! This sandwich turned out wonderful! The small tweaks made to increase its healthy benefits were hardly noticed when compared to the original. The whole wheat sourdough loaf made the sandwich feel hearty and even more comforting and the reduced sodium was undetected by my palate. This is certainly a dish worth having in your back pocket when those cooler days strike!